How to tie the Blake's Hitch. The Blake’s Hitch is a friction knot popular with arborists for ascending and descending on ropes. The name derives from Jason Blake who is credited with describing the knot to other arborists in 1994. This hitch has the advantage that it can be tied with the end of a rope instead of requiring a Prusik Loop. A “stopper knot” such as the Figure Eight is recommended to be tied with tag end after the knot is drawn up. Scroll to see Animated Blake's Hitch Knot below the illustration and tying instructions. Wrap line four times around other rope, working from bottom to top. Leave room in 2nd wrap to accommodate tag end of rope. Run tag end down to and over standing line, behind static rope and out through 2nd wrap. 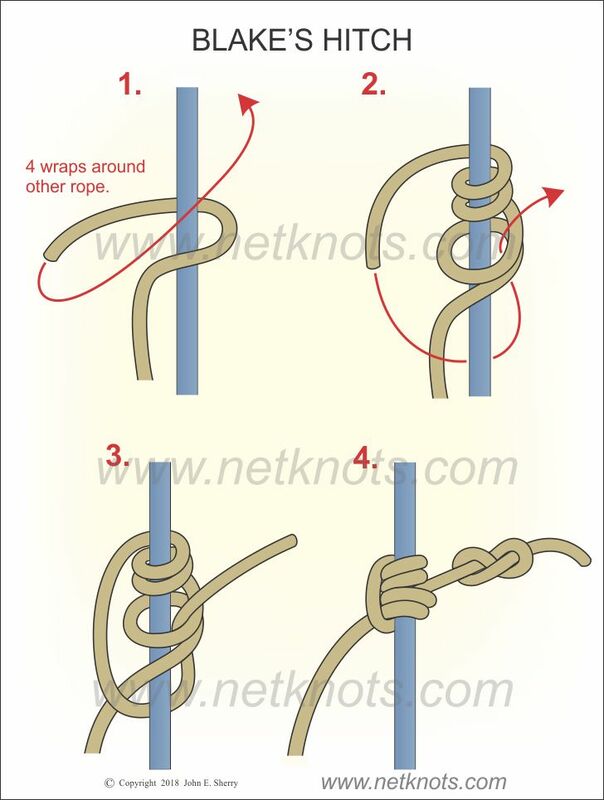 Tighten knot and finish with a stopper knot (Figure Eight) at the end of the line.